Heat oil in a large saucepan over low-medium heat and cook onion and garlic until golden. Add beef, breaking up large chunks with wooden spoon. Stir occasionally until meat is has browned. Add tomato, tomato paste. Mix well and bring to boil. Reduce heat, add herbs, spice, anchovies and olives and simmer on low heat for around 30 minutes semi-covered until sauce thickens. Cook spaghetti in a large saucepan of boiling water until tender. Drain well. 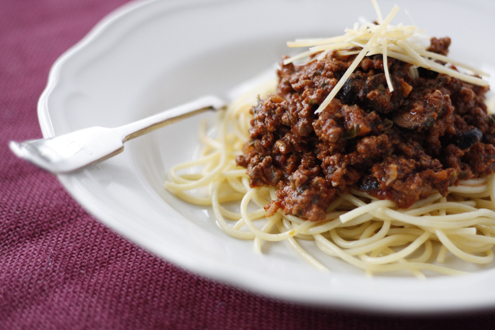 Divide cooked pasta evenly among 4 bowls, top with sauce and a sprinkling of grated cheese. Variations: Add some chopped capsicum, sliced mushrooms or grated zucchini along with the add herbs. Serving suggestion: Serve with either a green salad or some steamed/ blanched green vegetables such as zucchini, brocoli, brusels sprouts or green beans. Seems that 150 gr of spaghetti for 4 persons is a bit mean, specially as you have 700 gr of meat. Should be per person. So I can have carbohydrates elsewhere, I make bolognese and use cauliflower as the ‘bulk’. Just cut it up and mix with the bolognese. Wonderful!! I though tomatoes were a ‘free food’? Why are they listed as a main carb? Tinned tomatoes fall into the carb list because in recipe development, to be accurate, it is necessary to count up almost everything as it makes a difference to the overall carb amount. Most items, even ‘free vege’ contain some carb so we have focused on those that have enough to matter. It all depends on context i.e. carbwise if you were eating a carrot stick it probably wouldn’t count but if you had a bowl of carrot soup or a carrot juice it would! Hope this helps, Natasha. If the recipe serves 4 shouldn’t the pasta be 600g in total ( one serve is 150g) ?? Hey Michelle. Thanks for your comment. See my responses above. Unfortunately pasta is really high in carbohydrates so you have to really watch the quantity. A reader suggested above to bulk up the pasta with cauliflower which is a free food and quite filling. A great idea! Cheers, Lisa. We served this over spaghetti squash instead of pasta as a way to limit carbs. Not quite the same, but a nice substitute to be able to eat a little more. What if its a wholemeal pasta? can you add extra?